1. Open your Dovecraft 6x6 card blank and measure along the score line at 4cm and 5.5cm on the left hand side and the right hand side, ensuring to make a mark at each measurement. 2. From the marks you created, score from each of these to the bottom of the card. Repeat this on the opposite side. 3. Cut two, 3cm x 15cm strips of Simply Creative Mankind paper. Cut these down to fit the sides of the front of the card. Stick each piece down with Dovecraft Perma Fix tape. 4. Next, cut a coordinating Mankind 15cm x 15cm piece of paper down to fit the front panel of your card. 5. Add strips of Dovecraft Permafix to the front of your Dovecraft frame. Turn it over onto a sheet of Simply Creative Mankind paper ensuring to place it on the back of the design. Draw around it and cut off the excess around the frame, use a craft knife to cut out the centre of the frame. 6. Cut a coordinating sheet of Mankind paper to fit the back of the photo frame. Stick it with Dovecraft Permafix to the back, ensuring the Mankind design is facing the front. 7. Cut two small banner shapes and adhere them to the top, left hand side of the frame with 3D foam pads. Wrap a length of twine around the frame and tie together the ends at the front. Adhere your frame to the middle of your card, at an angle with Dovecraft Perma Fix tape. 8. Die cut the guitar onto the First Edition Wild at Heart wooden paper design and the music note die onto a sheet of Mankind paper. Stick them to your photo frame with 3D foam pads, ensuring to space them out. 9. 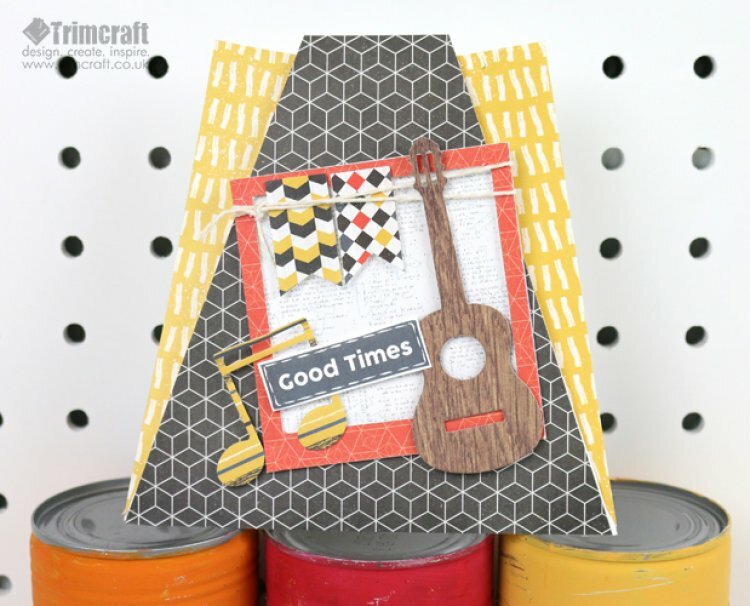 Cut out the ‘Good Times’ sentiment from your Mankind paper pad and adhere it to the photo frame with 3D foam squares, making sure to overlap the diecuts. This musical craft is really brought to life by the new card fold technique, and with our step by step guide why not give it a go? We’d love to see your versions of this card so remember to upload them to the inspiration area or tag us in your social media posts with #trimcraft.